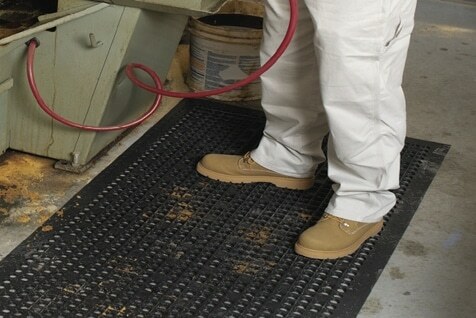 It’s no secret that floor mats are a great way to create a safer workplace. Good quality, well maintained mats can play a significant role in preventing trips and slips for both employees and customers. The right mat can also help to protect employees from muscle strain and fatigue. But How Do You Know Which Mat Is Right For Your Workplace? Non slip mats serve a very different purpose to anti fatigue mats: your business type and the nature of the work that is undertaken there will determine the type of mat that is appropriate for you. Keep in mind that water is not the only slip hazard – dirt and dust can also create a slippery surface. Anti fatigue mats, on the other hand, are ideal to decrease foot weariness for workers who stand in one position for prolonged periods or are on their feet all day. Anti fatigue matting absorbs the shock due to walking, providing a cushioning effect that reduces foot fatigue. Be aware that non slip matting can increase foot fatigue as the mat surface acts to ‘grab’ the shoe soles, causing feet to move forward in the shoe. It’s important to know which type of mat suits your particular situation. Some workplaces will benefit from both non slip mats and anti fatigue mats, while others will only require one type of mat. To ensure your workplace is as safe as it can be it makes sense to get some expert advice regarding the type of mat(s) appropriate to your situation. Consider trying a mat rental service. A good service will provide regular pick-up and exchange, ensuring that the mats in your workplace are always clean and in good repair – significant when you consider that old, worn mats can be a trip hazard. A clean office will benefit both employees and customers; this will give everyone a very good impression. Our Wet Area Mats and Anti-Fatigue Mats — all are made from recycled eco-friendly materials.